Squeaky door hinges are right up there with dripping faucets on the irritation scale. The squeak develops over time until you can't stand it and something needs to be done. Dealing with a noisy hinge should be an easy thing to fix. Some suitable lubricant is all you need. For related information see 'Troubleshooting Door Problems', 'Repairing Door Hinges', 'Adjusting Interior Doors' and 'How To Adjust Exterior Doors'. Door hinges are a moving part. They are made of two pieces of flat metal that have notched tabs of metal. These tabs interlock with the tabs on the other side of the hinge and are wrapped around a pin that hold them together. When the door opens and closes, the plates rub against each other and against the pin. When the grease or graphite wears away you will get metal rubbing against metal. That's when the squeaks start. There is no point in putting off this repair. It should only take a few minutes. In five minutes or less you can quit cringing every time someone opens the door. A service man will likely charge you $50 to $75 to take care of this problem. This is mostly due to the fact that he has to spend time driving there. Fixing squeaky door hinges is pretty simple and does not take much effort. This is already the simplest repair you can make with a door hinge. There is not simpler task to perform. Getting oil all over the door and wall is probably the biggest problem you will face. Use the lubricant sparingly. Always keep a rag handy when you are using oil and other lubricants. Tight squeaking door hinges are pretty aggravating. Most of the time, you can fix them with a little oil. Try lubricating the hinges first. Use a recommended silicone spray, oil or grease made for this purpose. You can use a punch and a hammer to drive the pin out, (usually from the bottom of the hinge up, unless it was installed upside down). For doors with only two hinges, leave the pins in about halfway. Keep a rag handy and apply the lubricant sparingly, but in enough quantity to solve the problem. Watch for drips and oozing. 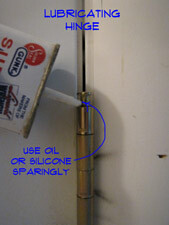 Replace the pin and open and close the door several times, working the lubricant in. Are the hinges rusted or painted beyond what a little silicone spray can take care of? Replacing them is easy if you get the same size. A door with only two hinges will need to be taken off before the hinges can be changed. Open the door and put something under the bottom to support it (a block of wood, book, not your toe). Unscrew the bottom hinge first and then the top. Hang onto the door when you release the last screw. For solid core or wood doors you may want to get some help when you take the door off. Lean the door against the wall and finish removing the hinges. Obtain enough replacement hinges for the door, usually three. Change them one at a time. You may need a chisel or knife to get them loose if they have been painted in place over time. Replacing the hinges, even if you do them one at a time, is repairing a prehung interior door. Well done! Before you consider replacing the hinges, try loosening tight door hinges with lubricant. Use a recommended silicone spray, oil or grease made for this purpose. You can use a punch and a hammer to drive the pin out, (usually from the bottom of the hinge up, unless it was installed upside down). Keep a rag handy and apply the lubricant sparingly, but in enough quantity to solve the problem. Watch for drips and oozing. Replace the pin and open and close the door several times, working the lubricant in. One or all of the hinges could need attention. Only take one pin out at a time. Taking out two or three will cause the door to fall and possibly damage it. Only take all the pins out when you are prepared to remove the door. Loosening tight door hinges by lubricating the pins may be a maintenance item that needs to be repeated periodically. Are the hinges rusted or painted beyond what a little silicone spray can take care of? Replacing them is easy if you get the same size. Remove the middle hinge and take it with you to match up at the hardware store. Obtain enough replacement hinges for the door, usually three. Change them one at a time. You may need a chisel or knife to get them loose if they have been painted in place over time. Replacing the hinges, even if you do them one at a time qualifies as a successful entry door repair. In Step One the article 'Purchasing Door Hinge Lubricant', helped you to make sure that you get the right oil or grease for your door hinges. Most home supply or hardware stores have what you need. 'Lubricating Door Hinges' is the article that covers the actual oiling of the door hinges. It is a pretty easy job, when you set aside the mess. Sometimes the door is out of adjustment and causing the door to bind. When this happens, oil alone may not solve the problem. See the article 'How To Adjust Door Hinges' for information and instructions on this repair. Fixing a squeaky door hinge should not have been too much trouble for you. You have to take the pins out to apply the lubricant. You put them back in and that should take care of the problem. Is your door quiet now? Good, you are done with this project. If you are a homeowner you have other projects you need to attend to. Since this one was so easy you are probably inspired to attempt something else.